And here is the finished fly cutter mounted on an arbor between lathe centers, doing what it is supposed to do -- milling a surface on the new boring table casting. Also milling the side of the table. At this point, I'd decided to add removable bolt-on wings to the sides of the table -- these would be L shaped and take bolts for clamping flat pieces down on the table. Also some bolt on cross pieces that could be used similarly. 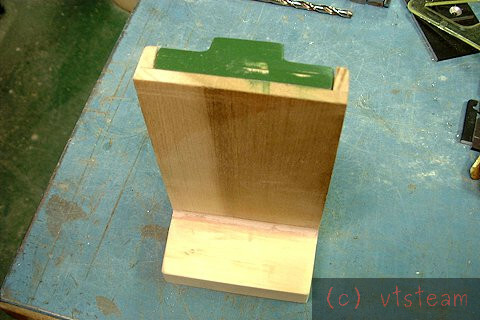 Anyway, I needed the sides to be square and milled to accept the add-ons. The fly cutter worked well for this, too. Cutting the side. I had to relieve the lathe tool for a long way to give it clearance, and make separate tools for each side, but it worked! Patterns for table add-on pieces, and another smaller fly cutter. 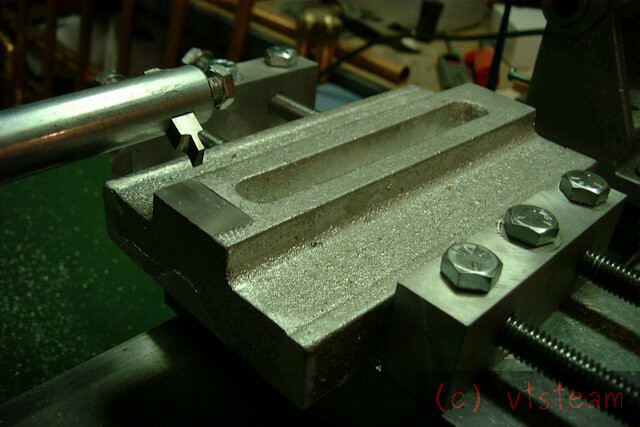 The mold cavity for the main body of the new fly cutter, with the steel core in place. It has been sooted in a candle as a release coating. Small holes are steam vents. White powder is parting dust. 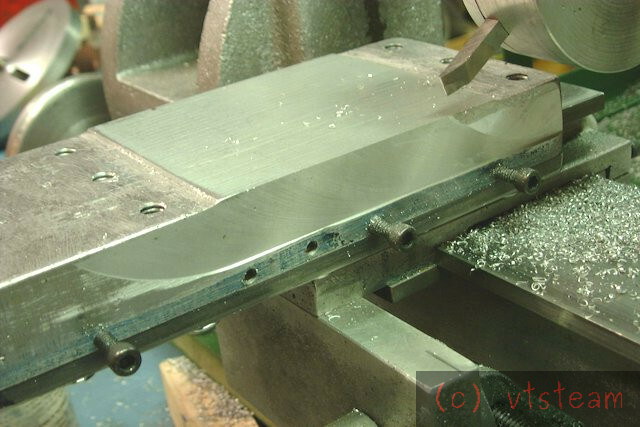 Table extensions have been rough filed and drilled and tapped, ready for clean-up and squaring on the faceplate. Doing two at a time here makes it faster, makes them come out the same depth, also balances the faceplate load. Also facing the rectangular bars. This time using two angle plates bolted together on the lathe like a vice to hold the part. This method again from the Gingery books. Another Gingery work holding device for the faceplate is the 2 jaw chuck. Here being used to center drill the new fly cutter acsting. 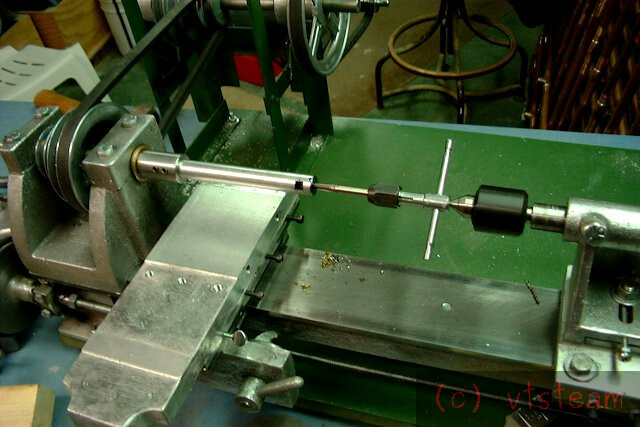 The 2 jaw takes the place of a 3 jaw for round stock while the lathe is at its simple state. A little tricky to get used to at first since you have to indicate parts true, but really not that bad once you get handy tapping the fixture with a soft hammer to center. Practic makes perfect, Not a bad accessory considering it cost nothing but a little time to make. And for longer work you'd naturally turn between centers. Anyway -- the flycutter is being started here. The fly cutter further along, cover being bored. This time it is mounted on a short arbor held in the new milling spindle on the lathe. Since it's likely to spend a fair amount of its lifetime there, this is as good a way to mount it for machining as there can be. The new fly cutter at work. Here it is truing up the inside vertical face of the table extensions I had just cast, mounted on the boring table. The lathe boring table and clamping extensions mounted, being trued. 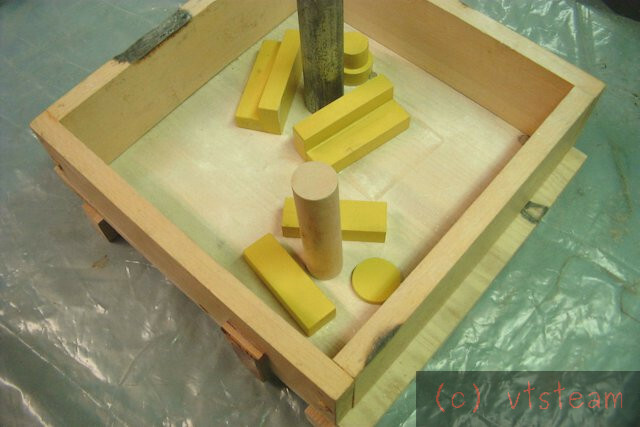 After the left vertical face was trued, the whole table an extensions were surfaced again to make them flat and even. 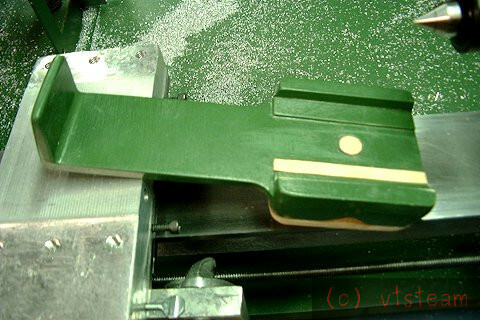 Then the right vertical extension face was milled. One of the things I realized in all of this was that there were three ways to adjust a Z axis in horizontal milling machines. The first is to have a knee or slide with the work on it. The second, less common way is to have the mill head adjustable in the Z dimension. 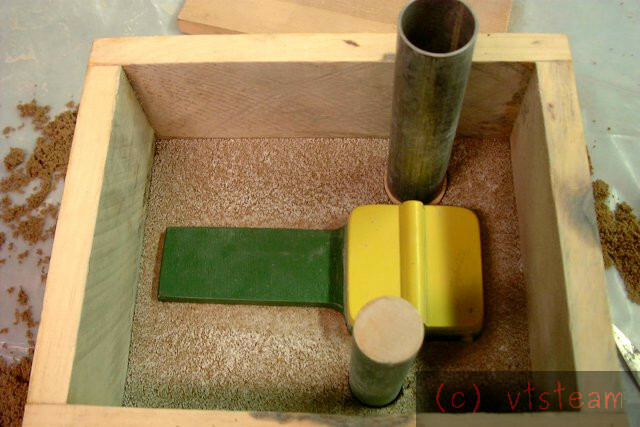 Gingery's horizontal mill uses this method. 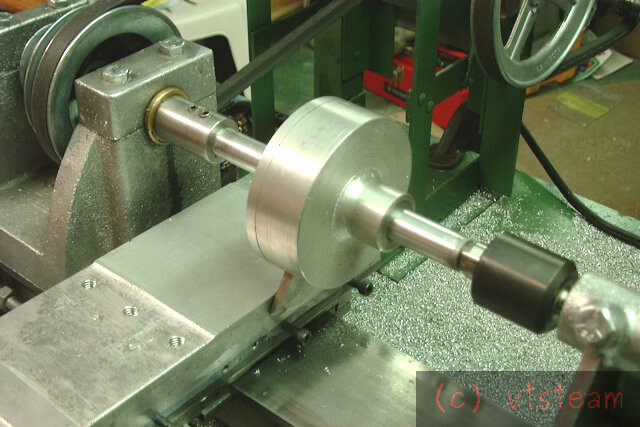 The third method which I had here developed for my lathe was to make a set of adjustable fly cutters to provide adjustment range up to the center height of the lathe These could be mounted on an arbor between centers, or a stub fly cutter. 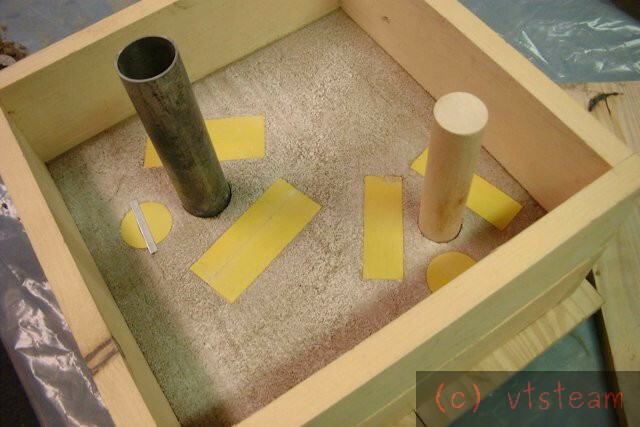 However this was mainly to be an intermediate stage in producing a vertical slide type, and in fact a rotary table version of that so I could mill the Tesla ports.So the next stage was casting the vertical ways and slides, which would ride on the boring and milling table as an accessory. 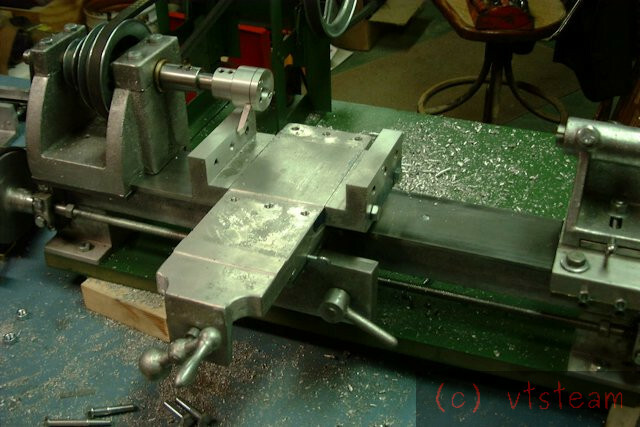 I would now use the milling table to finish those parts instead of laboriously filing and scraping them into bearing. I decided also that maybe I could re-use the library of slide patterns I'd already created in making the lathe. So I standardized on their dimensions, and realized I could add removable adapters to the patterns where they needed to be different than what was required by the lathe. Here is one of the adapter pattern pieces being glued up. And here it is attached to the lathe cross slide pattern. 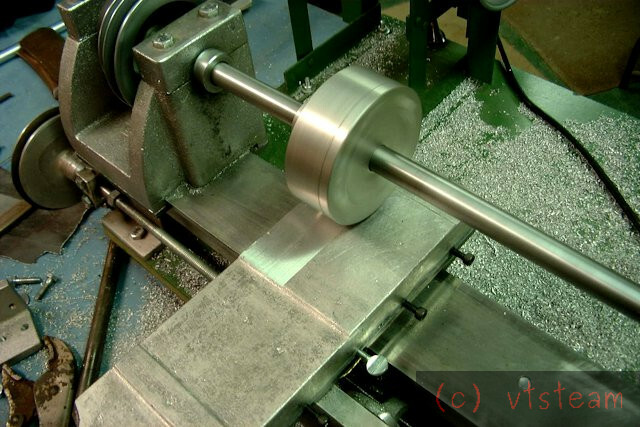 It fills a hole where a steel pivot rod was required on the lathe, and builds up the side's thickness. 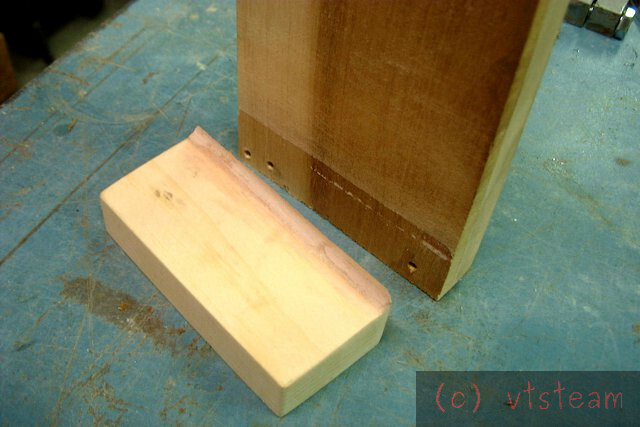 I also added additional width to the slide land bearing -- with a strip of wood. Here are three pieces that will become a single pattern for the vertical way base. On the left is the original cross slide way base, to the right are a big packing piece to add thickness and width, and a smaller piece which will form a right angle leg to bolt it to the milling table. 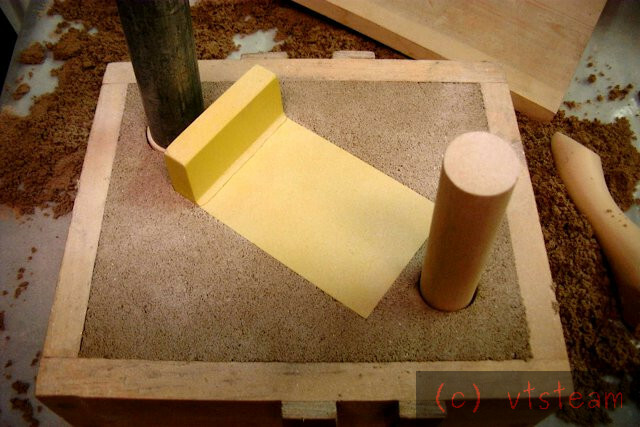 The leg is doweled as a loose piece to make molding easier, and has a fillet attached mad of Bondo. All of these add-on pieces have to have correct draft and fit in with the original pattern's draft. Here are the pieces fitted together. And painted and rammed up in the mold. Note the draft on the loose piece. If ever anybody had any doubts about building their own equipment they now know that it is possible. No machine shop required. Just the desire to want it. This is a fantastic thread. for sharing it with our members. Thank you BrassMachine and Dsquire! It's a pleasure to post these pics here with this group of creative people -- most have never been posted anywhere. I kind of forgot about it until you guys asked, and now editing and posting them and writing them up brings back what an exciting time it was to be doing all this and learning about how tools worked, casting, figuring out how I was going to get to the next step, etc. I lived and breathed this stuff for one winter. My thanks in turn have to go to David Gingery for setting me on that course, and giving me the capability and confidence through his books. The guy ought to get a Pulitzer prize for those typed up pages and hand drawn figures in a half dozen little paperbacks that he published himself. Anyway I suppose you want to see more of this project, so here goes. The other side of the vertical slide with the added on piece on top. I've added a split dowel to act as a core print for a hole I want in the finished casting. 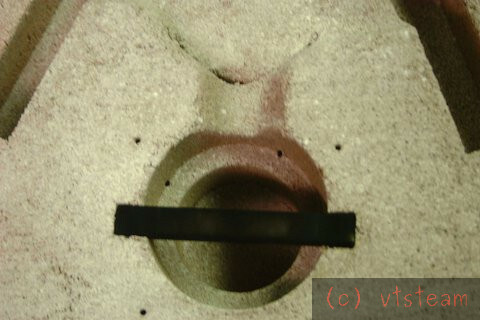 The imprint it leaves will be filled with a sooted steel core, and that will be knocked out of the finished casting to leave a circular channel. After casting these parts I was just about ready to mill them in the new milling and boring table. But since they would be rather high, I needed one more adjustable fly cutter -- of smaller diameter than the other two. Together the three would give me the full range for milling. This last one was essentially a boring bar, and could double as such. To make one you just drill two holes in a piece of cold rolled steel. 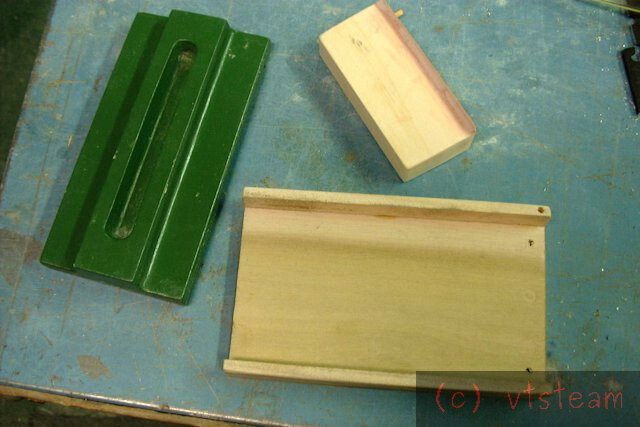 Square one out to fit a piece of lathe tool -- I do this with a small triangular file -- takes about ten minutes to do. 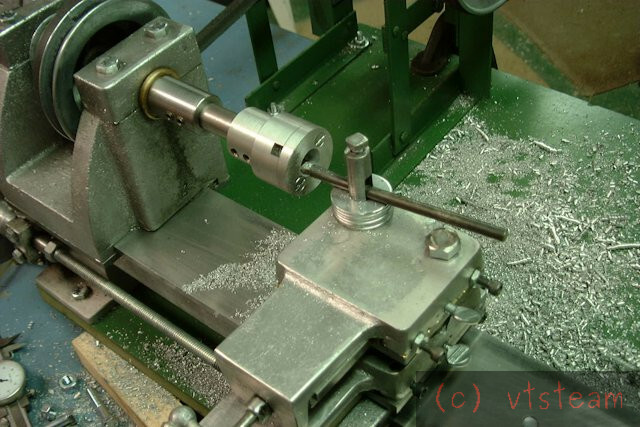 Then, tap the other hole in the end to take a set screw (fixing bolt). That's about it. 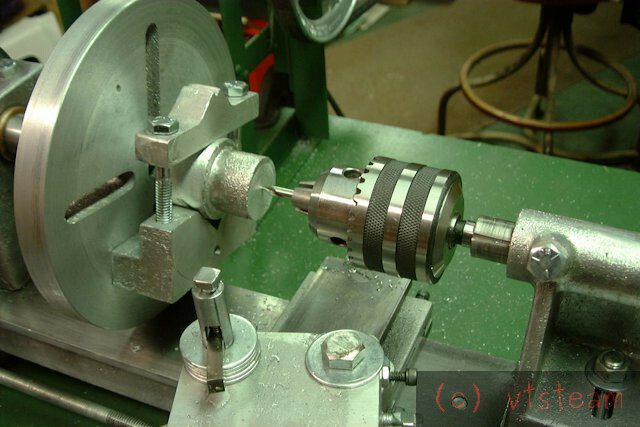 This tool can bore, mill, and cut gears with the appropriately ground bit of lathe tool. Here I'm tapping the end. 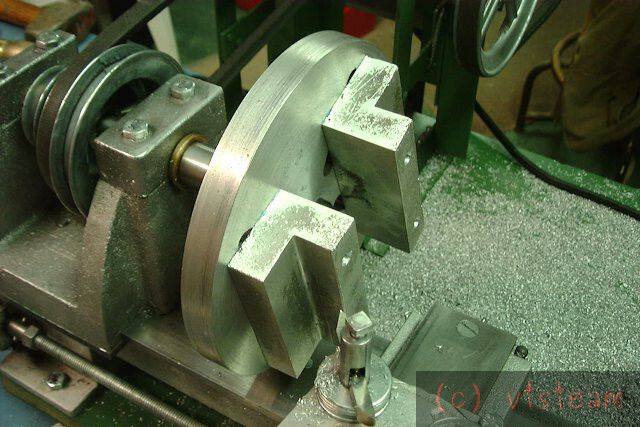 Naturally not using power, -- just rotating the headstock pulley by hand, while keeping light pressure on via the tailstock wheel. And here we are finally ready to mill the front face of the new vertical ways base. The face that will be milled will later get a slab of cold rolled steel attached. The trough is to take the lead screw. 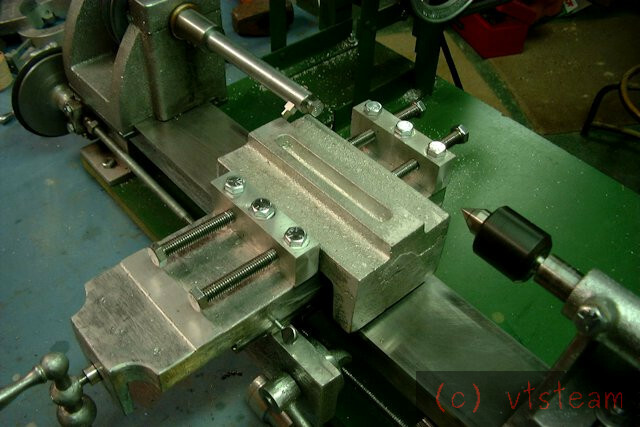 I've bolted to the milling table the two plain bars we cast earlier -- now cleaned up and drilled and tapped to act as a vice. 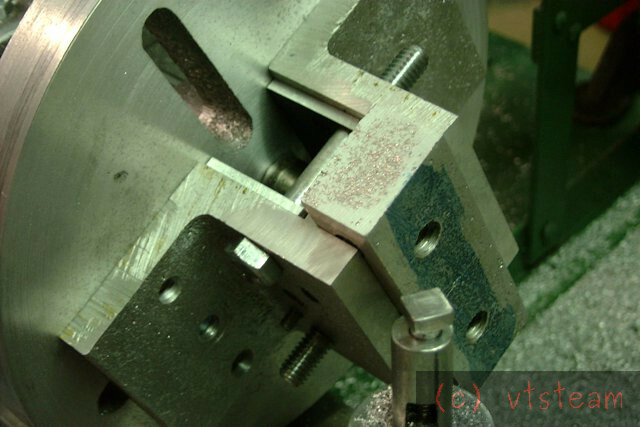 The screws which clamp the work are angled slightly downwards so they apply down force to the casting -- keeping it tight to the milling table. Since there are 4 of them they can accept irregular shapes. 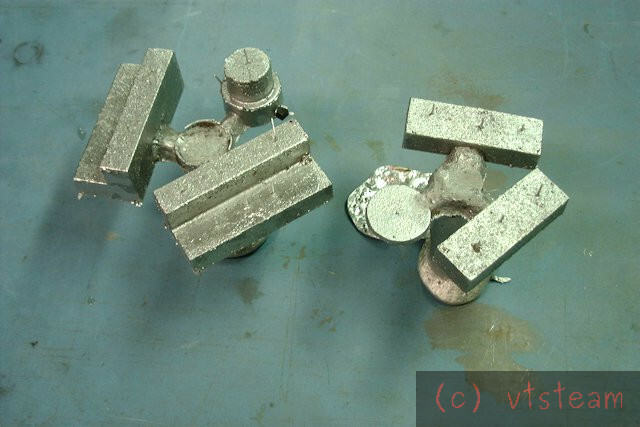 The other accessory castings -- the L shaped wing pieces have similar capability -- but they aren't used in this step. All four clamping pieces can be used at once if needed. 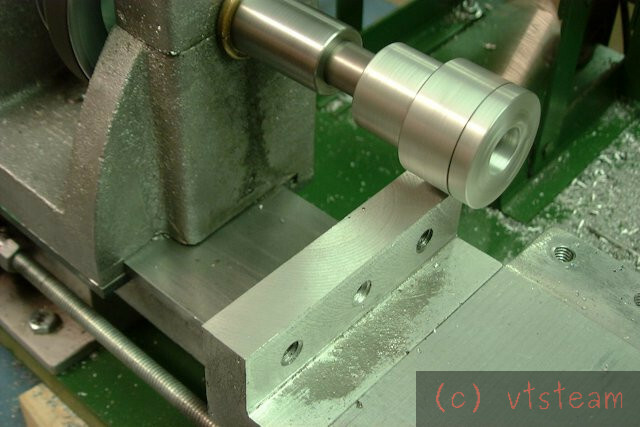 Making the first pass with the milling table -- what a great feeling that was! It was working!